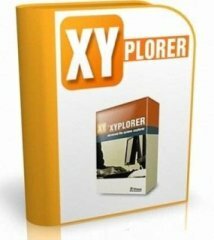 XYplorer Professional - файловый менеджер, достойная замена проводнику Windows, с поддержкой вкладок. Мощный поисковый механизм; предосмотр мультимедийных файлов (графика, аудио, видео); HEX и ASCII вьюер файлов; работа с mp3-тегами; широкие возможности для визуализации (выделение цветом избранных папок и пр. ); формирование фильтров отображения файлов; экспорт информации о файлах в CSV формат и многое другое. XYplorer не оставляет записей в реестре, поэтому возможна работа со сменных носителей, например с флешки. XYplorer Pro is a file manager for Windows. It features tabbed browsing, a powerful file search, a versatile preview, a highly customizable interface, optional dual pane, and a large array of unique ways to efficiently automate frequently recurring tasks. It’s fast, light, and portable. XYplorer with Tabs, Mini Tree, Tree Path Tracing, Breadcrumb Bar, Color Labels, Size Graphics, Tags, and Comments. Floating Preview to the right, with Photo Data. +++ Live Filter Box. Now you can choose the position of the Live Filter Box. status section of the Hover Box: Simply press key "I". status section of the Hover Box: Simply press key "S". +++ Compilation Soundtrack. Compiled to the music of Khruangbin. Dark Mode. Now XYplorer offers a portable, smart, instant dark mode. Just one click and the app turns dark in the blink of an eye. You can control the levels of darkness and text contrast to adjust the dark mode to your needs and likings. Works in each Windows version from XP onwards. Compilation Soundtrack. Compiled to the music of Angaleena Presley. -Maintenance. This is primarily a maintenance release with lots of bug fixes and small improvements, especially concerning the new Dark Mode. -Disallow Delete By Key. Now you can prevent accidental deletions-by-key in the folder tree. -Confirm Delete. The Confirm Delete prompt has been much improved. -Selection Stats. The Selection Stats dialog prompt has been much improved. -Random Rename. For what it's worth, now you can rename any number of files to random strings. Might come in handy if you make your money as a spy. -Compilation Soundtrack. Compiled to the music of Larkin Poe.